WASHINGTON — Hours after President Donald Trump fired off a confusing tweet about North Korea sanctions, the administration had a new explanation for his statement. Trump announced Friday afternoon that he was ordering a stop to "additional large scale" Treasury sanctions on Pyongyang that he said had been unveiled earlier in the day. 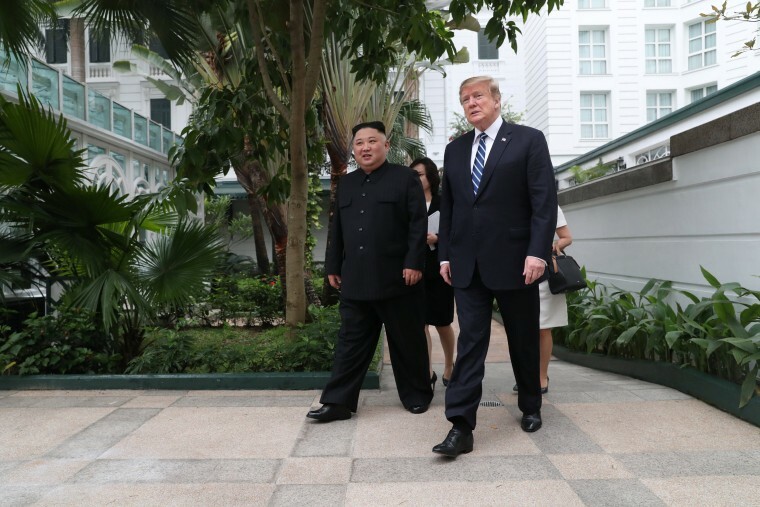 "It was announced today by the U.S. Treasury that additional large scale Sanctions would be added to those already existing Sanctions on North Korea," Trump wrote. "I have today ordered the withdrawal of those additional Sanctions!" But the Treasury Department had taken no such action on Friday, a fact that led North Korea experts to presume Trump was referring to sanctions applied to two Chinese shipping companies on Thursday because they allegedly did business with North Korea. In a statement released after Trump's tweet, White House press secretary Sarah Sanders declined to disabuse anyone of that notion — simply attributing his decision to his affinity for North Korean leader Kim Jong Un — and the National Security Council press office refused when asked to clarify whether Trump was referring to the shipping companies. "President Trump likes Chairman Kim and he doesn't think these sanctions will be necessary," Sanders said. But late Friday, a U.S. official and a personal familiar with the situation both told NBC News that Trump was talking about a plan to roll out a major new round of sanctions on Pyongyang that he scuttled before it could be publicly announced by his lieutenants. That is, he tweeted that he was killing a sanctions plan the public didn't know about until he announced he wasn't acting on it. For years, the U.S. has used the threat and imposition of sanctions to deter individuals, companies and foreign governments from doing business with the North Korean regime to squeeze that nation's economy and pressure Pyongyang to give up its nuclear program. The sanctions on the two Chinese shipping companies remain in place, according to two people familiar with the decision. In announcing those measures Thursday, Treasury Secretary Steven Mnuchin said the U.S. government wanted to make clear to shipping companies that they could not do business with North Korea as the American government tries to force Kim to give up his nuclear weapons. However, senior Trump administration officials also said Thursday that “the door is wide open” to more talks with North Korea, telling reporters that President Trump remains “personally engaged” and also wants contacts to occur on the working level, although they wouldn’t disclose whether any such contacts have occurred since the summit between the president and Kim.